In Britain the species was known only from Essex until it was discovered at Arne in Dorset in 1999 (Dawson 2000), where it was still present several years later. It was first recorded in 1961 at Colne Point, North Essex, and then in 1987 it was found at Shinglehead Point, North Essex, and Steeple Creek, South Essex, both on the Blackwater Estuary. It has also subsequently been found on several other small shingle areas in the Blackwater estuary. The species is widespread in central and southern Europe. In Britain H. auratus has been found among sparse vegetation on shingle, just below the line of the spring tide litter. The Arne site consists of a narrow sparsely vegetated shingle strip between saltmarsh and Poole Harbour (I. Dawson) and similarly at Steeple Creek the spider occurred on a narrow strip of shingle below the sea wall adjacent to saltmarsh and the tidal river. The spider can be seen running on shingle during periods of sunshine. Adults of both sexes have been found between May and August, but the main adult season is in May. Recorded from five locations since 1992. Showing no decline in overall area of occupancy but has not been found again in two hectads from which it was collected prior to 1992. The spider was found in some numbers in 1961 at Colne Point, Essex although it has not been re-found there despite extensive fieldwork. At Steeple Creek the spider was present in numbers on a small area of shingle and it has also been recorded in numbers on small shingle areas on the north side of the estuary at Tollesbury. It is also established at Arne, Dorset. The shingle strips and shell banks on which the spider survives are prone to damage by work on sea defences as well as destruction by exceptional tides and currents. The Blackwater sites consisted of small shingle strips and a shell bank, adjacent to the sea wall. Construction and maintenance of sea defences frequently destroy the strip of habitat in front of the sea wall, so, where possible, work should be carried out from the landward side of the existing bank. 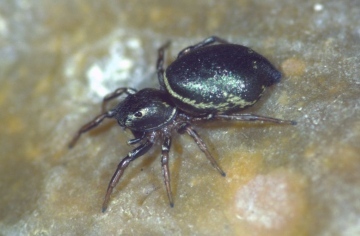 Rising sea levels and changing water flows and deposition caused by managed retreat scenarios threaten the survival of the small vulnerable shingle areas on which this spider occurs. Management of the small shingle areas is neither necessary nor desirable. Plans for managed retreat on the Essex coast could potentially take account of the desirability to create new shingle areas in the Colne and Blackwater through a full understanding of currents and shingle deposition in the estuaries.